The Structure of Proteins and Nucleic Acids. February 24, 1953. Invitation Larger Images / More Information. 1 p.
Letter from Dr. D. P. Riley of The Royal Institution, London, to LP RE: "Confidential" letter in which he asks for LP's advice. 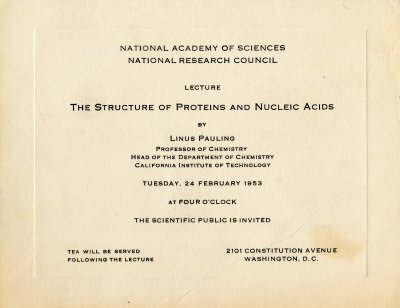 Writes that he has been offered a job in the Chemistry Department at USC, and asks LP for his confidential opinion of the department there, and whether he thinks he should move to the States. [Letter of response from LP to Dr. Riley March 13, 1953]. Letter from W.H. Freeman to LP RE: Asks LP if he has a second copy of the manuscript to give to Lloyd Malm, who writes an accompanying laboratory manual to LP's text. Also asks LP to limit corrections to errors and not include simple rewording to limit costs. [Reply from LP to Freeman March 17, 1953]. [Filed under LP Books: Box 1953b, Folder 1953b.1]. © 2015, Special Collections & Archives Research Center, OSU Libraries, Oregon State University.